Just one last make for 2013, since he’s wearing it today so I could snap some photos. This was one of my Christmas presents for Josh, another shirt using Burda’s Jakob pattern, in a lovely grey brushed flannel. He’s been wearing his first shirt loads this winter so I felt he deserved another one for Christmas. Lest you think I’m ever so selfless making him two shirts by the way, I actually – shh – really enjoy the process of sewing button-down shirts. I don’t often wear them myself (though I do have an Archer in the pipeline), so I’m quite happy to labour away on some selfless sewing if it also means indulging my inner precision-sewist from time to time. 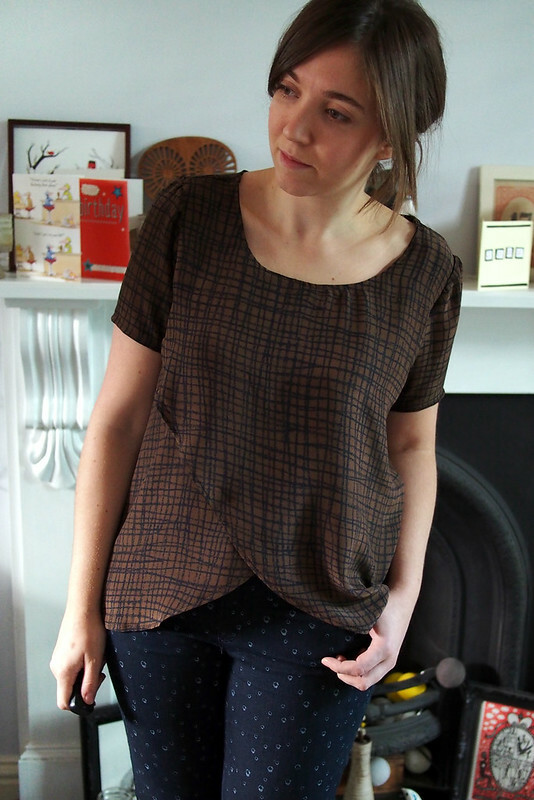 I used the same pattern at last time – Burda’s Jakob – since I knew it would fit without needing him to try it on and ruin the surprise. I just took in the side seams a tiny bit for a slimmer, smarter look since the first one was designed to go over t-shirts so is a little boxier. The fabric is from Dalston Mill. I’m not entirely sure what it is: it must be a poly/cotton blend as it’s happy in the washer and dryer and does not crease much, and it’s got a diagonal weave pattern like denim but a peachy-soft brushed finish like a flannel. (Locals, Dalston Mill also have a few ex-Hobbs suitings and wools which are really dreamy. I nearly bought one for this shirt but it was 2.5 times the price of this one!) Whatever it is, it was very nice to sew with and behaved much better than the thick wool from the first one. Construction was dead straightforward the second time round, especially using a lighter fabric. I did a slightly different pocket design to keep it interesting for myself, based on Jen Grainline’s tutorial, and also put in proper cuff plackets. 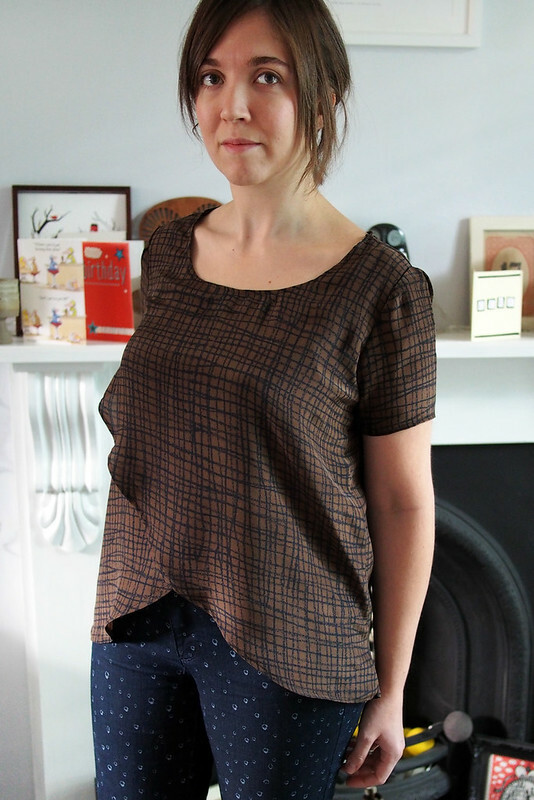 I used the Threads downloadable pattern for the plackets but with the Colette Hawthorn tutorial, as I found it made for a more precise result in fewer steps. They are still not exactly perfect and should be shorter, but I was a bit up against it with time so couldn’t redo them. Next time they’ll be better! 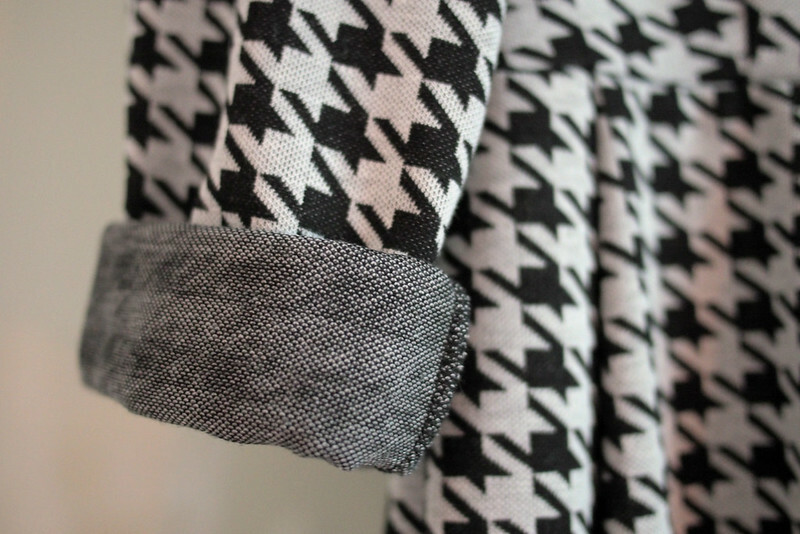 As before, the buttons and buttonholes are all machine stitched – such a timesaver. Alright that’s me over and out for 2013. I already have some really exciting sewing stuff planned for next year, including my first 100% self-drafted pattern which I’ve been working away on since Christmas. I’m going to digitise and give away, so hope you like it! Until then, happy new year. Just squeezing in one more make before Christmas! I had an unexpected day off on Friday so had a selfish sewing day – after all the gift buying/sewing it felt pretty good. 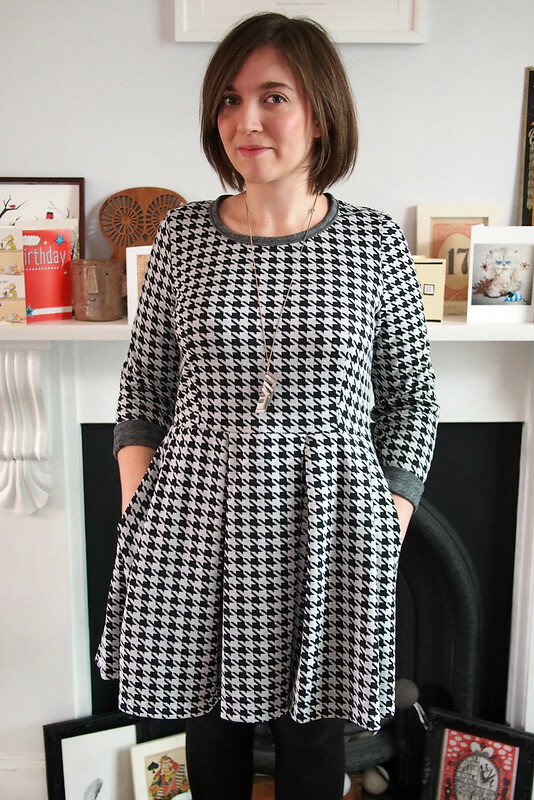 I’ve had Victory Patterns’ Lola dress on my radar for a while – lord knows I love a comfy day dress, and look at those POCKETS – but to be honest I was put off by all the panels, imagining all the little pieces that would need to be cut and assembled. 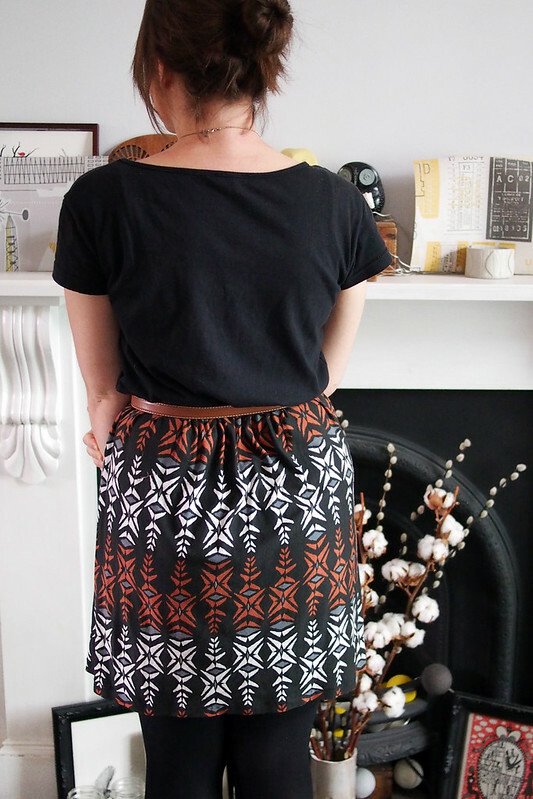 I finally bought the print-at-home pattern after seeing some beautiful versions from Rachel, Lauren and Dixie, and found my fears completely unfounded: this lovely little pattern comes together very quickly and is a delight to sew. In fact I think the panelling details make this a more enjoyable project to sew than a regular dress pattern: it all whizzed up quickly on the overlocker and every piece fitted perfectly into place. I love the bodice, with its flattering princess seams, and how the edge panels wrap around with no side seam. And the raglan sleeves! And did I mention the POCKETS? Love it all, really. I was a good girl and used up some stash fabrics: a solid grey ponte knit, part of a big remnant piece from Rolls & Rems, and a lovely crescent moon printed ponte from Minerva (the rest of which has gone into a Christmas present!). The shades of grey aren’t a perfect match but I think they look nice together and make this casual sweatshirt dress a little bit smarter. I omitted the triangle neckline decal and the ribbing panel on the bottom, and also just used the ponte instead of ribbing at the neckline and cuffs. I didn’t toile as I was using stash fabrics, but I would recommend it as I found I needed to do a bit of adjustment which was tricky to retrofit. I cut a straight size 6 according to my measurements but found it a bit loose around the middle and too long in the body. I was able to fix the length by taking about 1.5″ off the bottom panels, but it’s still a little baggy around the middle as I couldn’t really alter it once constructed. I will adjust the pattern pieces to fix these bits before making another Lola (yes, I’m sure there will be more). It even goes great with my coat! 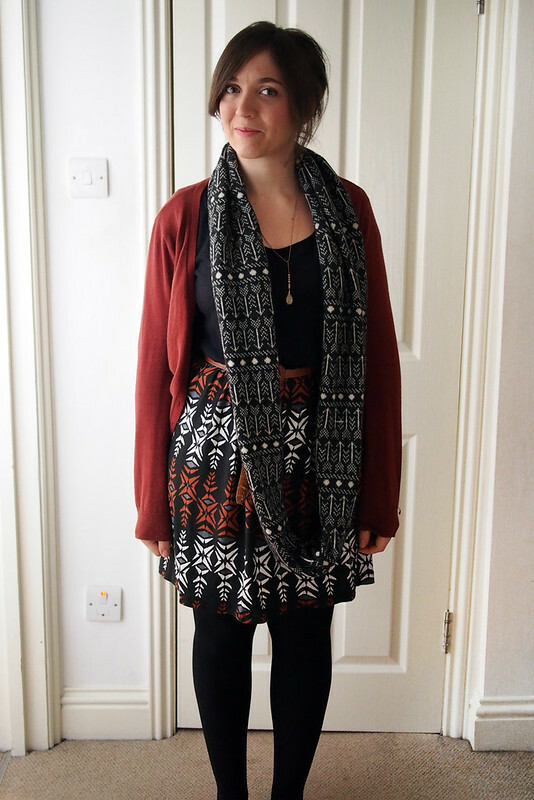 I love a me-made outfit day (apart from the leggings, though I definitely want to make some of those next year too). I think this’ll be my last post before diving headlong into a week or two of festivities, so hope you all have a lovely Christmas and see you on the other side! 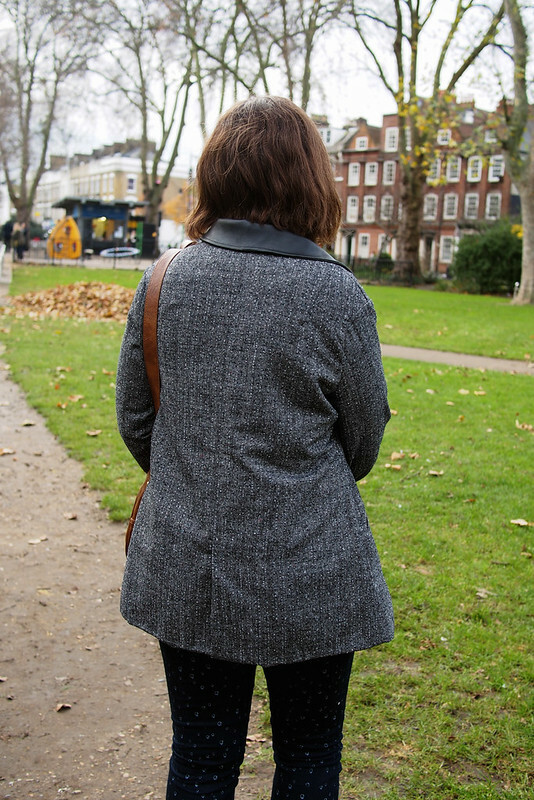 I finished my new coat last weekend, it’s just taken a little while to get some decent photos but I got Josh to snap these when we went for our usual weekend wander today. I’ve been wearing this bad boy every day since I finished it! 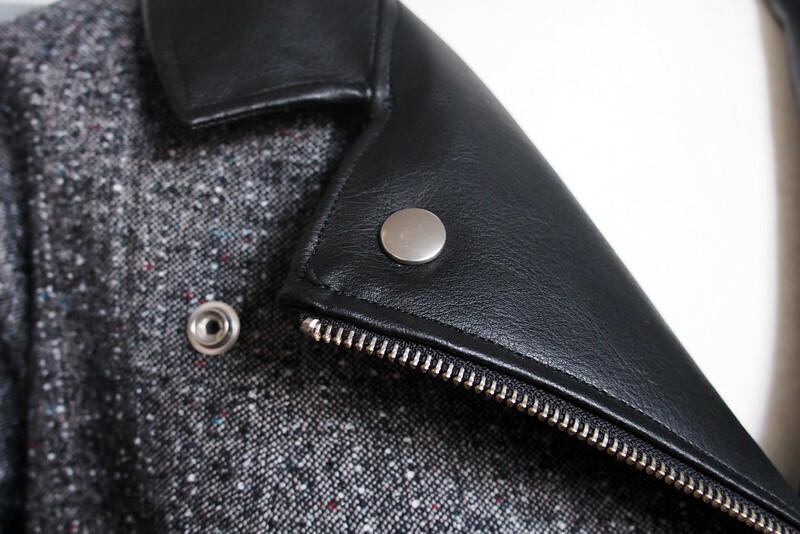 I stuck fairly faithfully to my plan and ended up with a tweed and pleather biker-inspired number with lots of nice hardware details, but hopefully cosy and classic enough to see me through this (and a few more) winters. Details? Yes, there are many, read on. 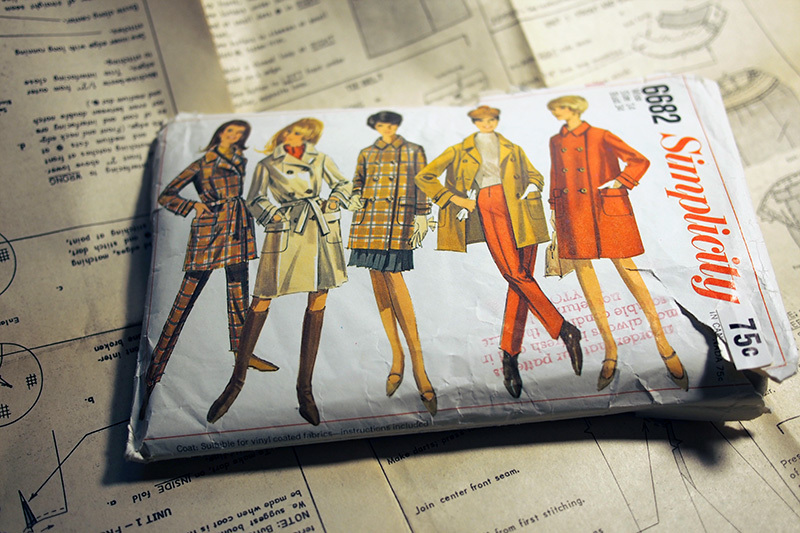 As I mentioned before, the pattern is a somewhat modified version of vintage Simplicity 6682. 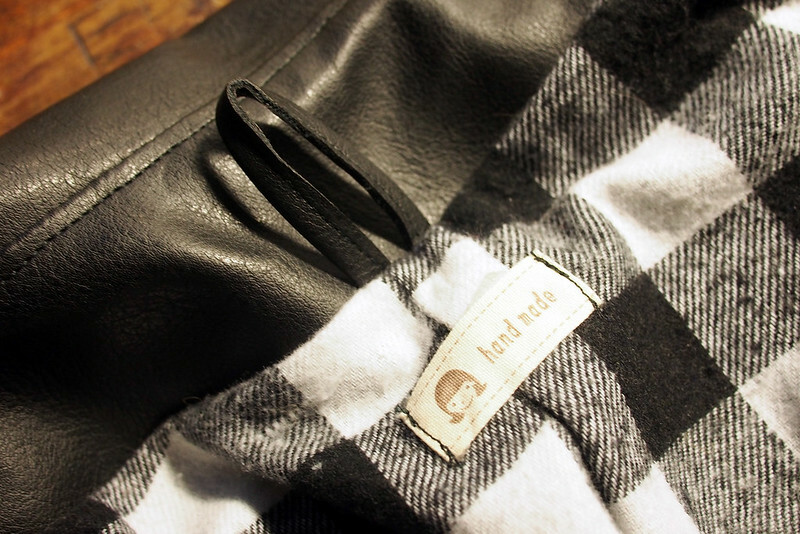 This is a great simple coat pattern, and a perfect canvas for modifications. 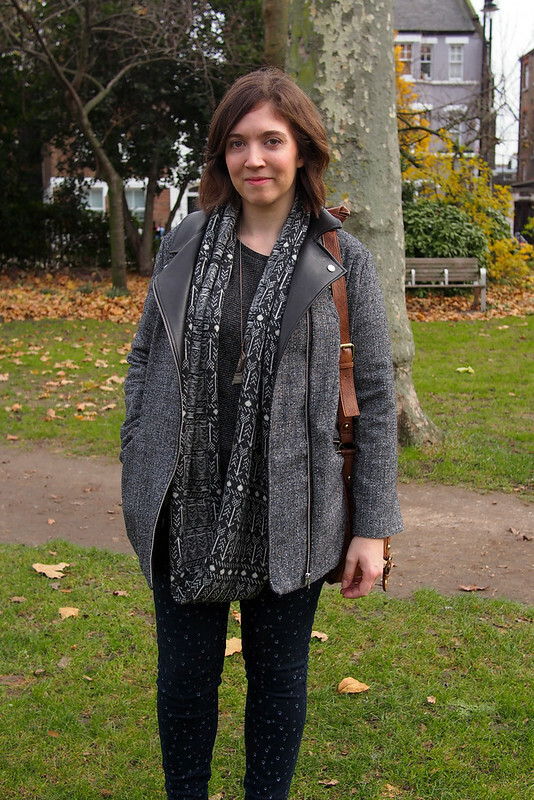 Just check out Eva’s version to see how it can look with different fabric and fastenings: it could work as a pea coat, classic trench, raincoat or biker. 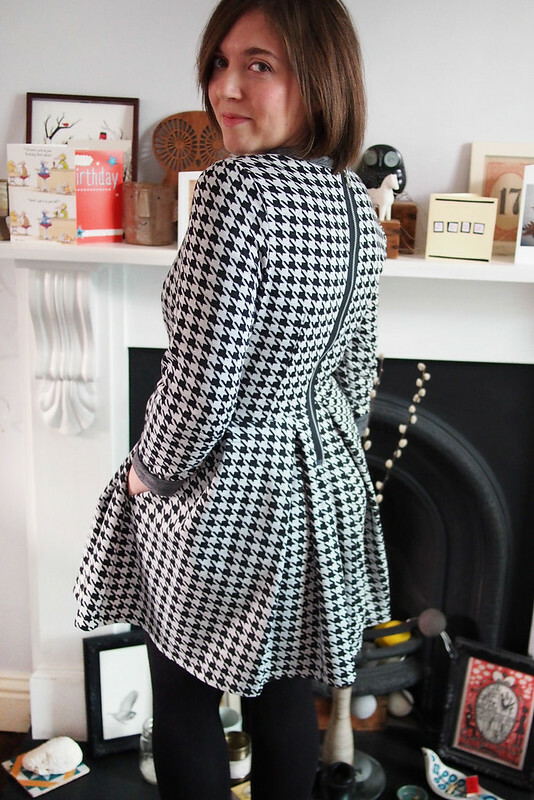 It’s got lots of clever yet simple-to-sew fitting details like front darts which make the lapels fall naturally outwards, back shoulder darts for a nice fit across the upper back, and a sweet kick pleat at the bum. I picked up a size 14 on eBay which is slightly smaller than my measurements but it’s quite generous with ease. I took about 6″ of length out of the torso and nipped a bit off the side seams to get the shape I was after but the fit overall was good out of the box. I’m afraid to say I discarded the (superb and well-diagrammed) included instructions and kind of winged it my own way. This mostly involved lots of draping the in-progress coat on my mannequin then frowning and chin-stroking to figure out how to achieve the next step. It was a pretty time consuming and silly way to work. 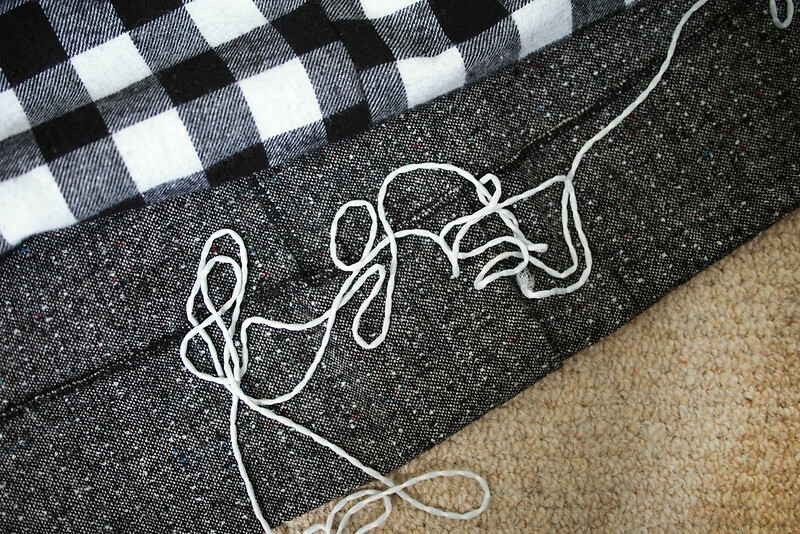 Ever decided to reshape side seams after flat-felling it all, then having to painstakingly unpick three layers of stitching from boucle wool? 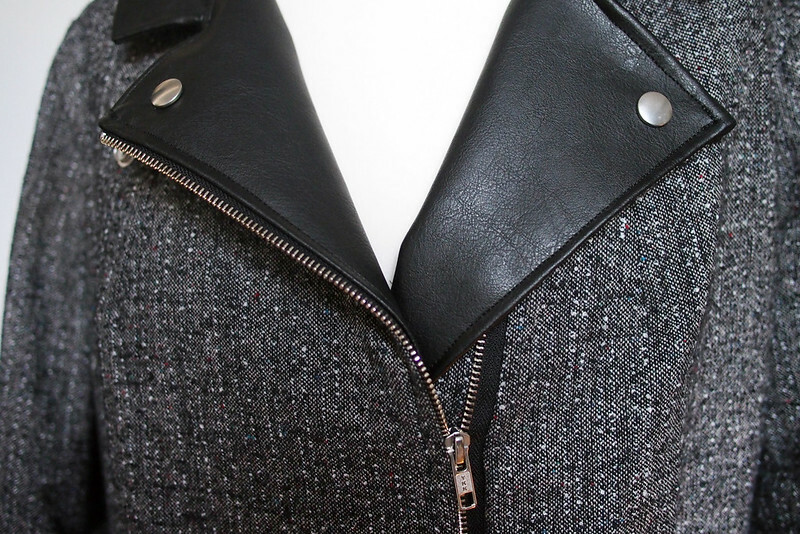 Or deciding the pleather collar actually needs to be narrower after topstitching it in place? TWICE? I even didn’t know how I was going to fit the front zip at all until I came to sew it. In the end I examined some similar coats and made up a technique of sandwiching one half into the front facing seam, and for the other half I literally sliced the front of my coat up the middle and wedged the zip in. Miraculously it worked out pretty well, but I wouldn’t recommend it as a working method. Nonetheless I did really enjoy the construction process. 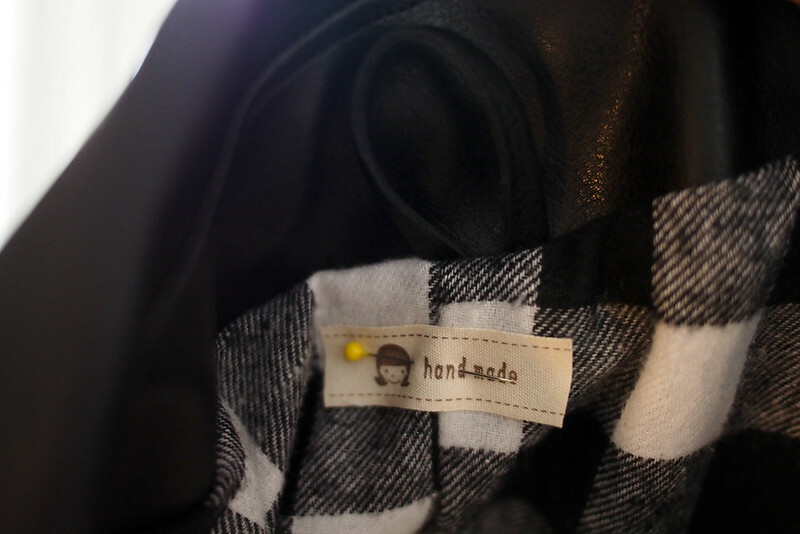 Man, making coats is addictive. 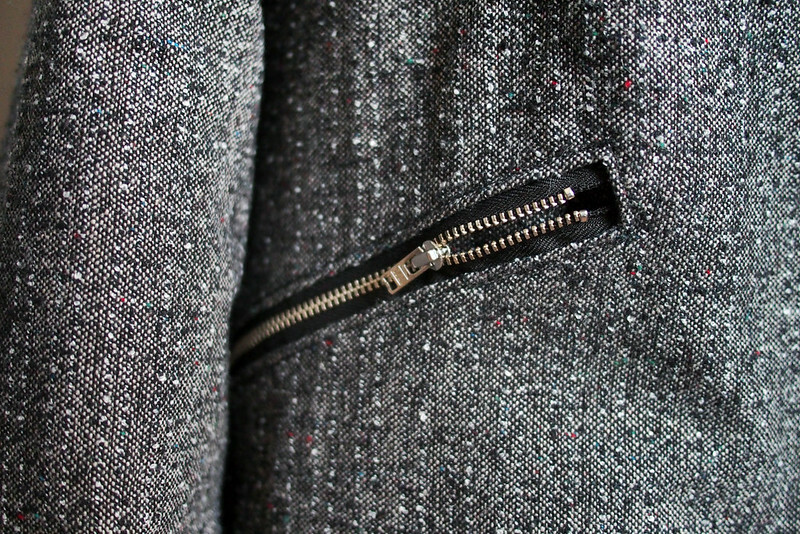 I did like my technique for the welted zipped pockets, though, and they’re probably my favourite feature of the coat. I read a bunch of online tutorials (Gertie’s video is good) and then melded them into my own technique which basically involved using tape as a sewing guide and fusible interfacing as welt facing. Worked great! 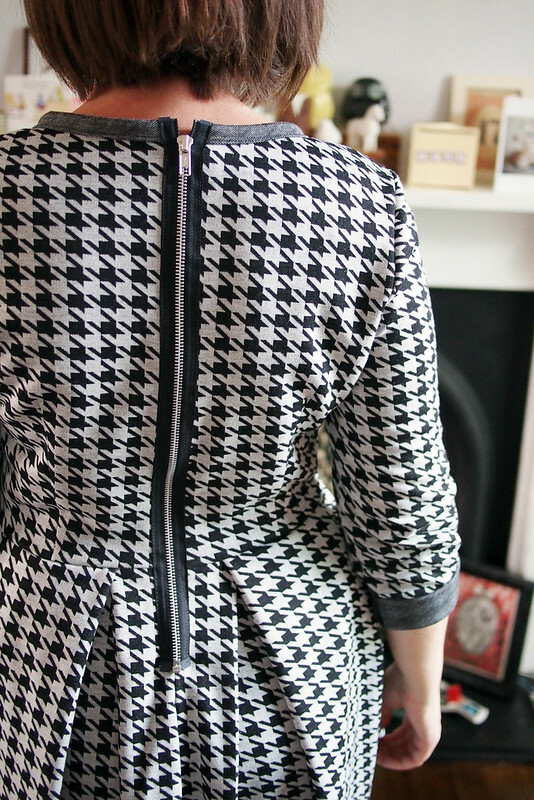 I couldn’t find the double-closed-end zips Gertie recommends but regular single-closed-end ones did the job fine. I made the pocket bags from the fashion fabric as I knew it’d peek out, and made them nice and deep so they can securely hold my stuff as well as keeping my paws warm. I’ve also fond of the heavy duty snaps on the lapels, which involved the use of a hammer and everything. Initially I decided to add these to help the pleather lapels stay folded out nicely, but I like the RTW type look they give the coat too, and they match all the silver zip teeth. I made my life rather more difficult by deciding to work the collar and lapels in pleather (faux leather). In some ways pleather is pretty nice to work with: it cuts cleanly, doesn’t distort or fray, and is fairly malleable. I used a leather needle and extra-strong Gutermann thread which I’m sure made life easier. However you can’t baste, pin or unpick it without leaving hole marks, cannot ease in curves easily, and can’t press it to manoeuvre it into shape, which was especially tricky for the collar piece. I got there eventually though: sometimes just letting it sit overnight on the dress form seemed to help it to meld into shape. Don’t look too closely at the notched lapels though, they’re a bit scrappy up close as I actually did have to unpick them once to get them to lie flat. If I were to work with pleather again, I would pick a more quality and lightweight one. I went for some cheap upholstery-weight stuff from eBay, then afterwards found some lovely soft, supple stuff in Cloth House which I imagine would have worked way better and been worth the expense. 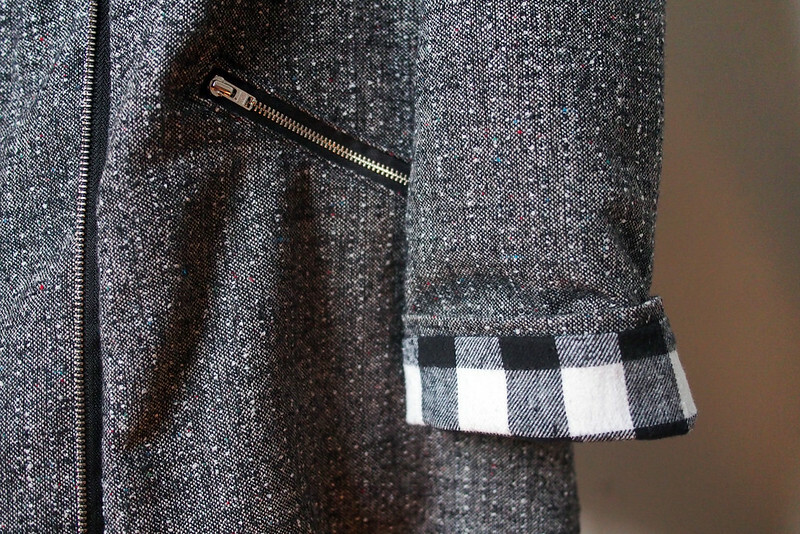 However, its weight meant I didn’t use any interfacing on this entire coat aside from the pocket facings. For some reason I can’t bear cutting and attaching interfacing so that’s a big plus. It’s lined in brushed cotton check. I know you’re supposed to pick a silky fabric for lining so you can slip it on and off easily but this brushed plaid won me over with snuggliness, and I honestly don’t have any trouble getting into or out of it. I also thought something lighter would not play nicely where it met the firm pleather facing. I bagged the neck/facing edges and sleeve cuffs from the inside and hand slip-stitched down the bottom edge, adding a line of weighted cord along the hem to get a nice crisp finish. Unfortunately I used a cheap brushed cotton so it’s already starting to pill a bit, but it is super cosy. I think the cuffs look cute with a cheeky turn-up to flash the lining. Only remembered the hang loop right at the end! It’s just a scrap of the pleather folded and stitched over. (Don’t ask about that atrocious pattern-mismatch across the back seam, no idea what went wrong there.) Honestly, never forget your hang loop because as well as being practical, it is guaranteed to be the part of the coat that other people ooh and aah over the most. Needless to say I’m super pleased with how my second coat turned out and it’s already my go-to daily coat. It goes really well with my favourite scarf and most of my wardrobe (since it’s 90% grey too) and it’s cosy enough for the dip in temperature I think we’re about to get. It was one of those projects where I really wanted it to be finished so I could start wearing it RIGHT NOW. But at the same time I wanted it to be right so tried not to rush and to fix all the little niggles that would have ended up annoying me. All in all it took two weeks and I guess about 20 hours sew-time (and countless chin-stroking time). It’s kind of funny how I love really long, complicated projects and also really quick flippy jersey dresses the most out of everything. A coat like this really appealed to my designer nature: picking where the pockets should be placed and how slanted, the hardware details, the collar width and so on. It feels good to see my skill level slowly coming up to my visions and being able to make something like this that I could never find ‘just right’ in the shops. Total: about £68. Not bad at all. 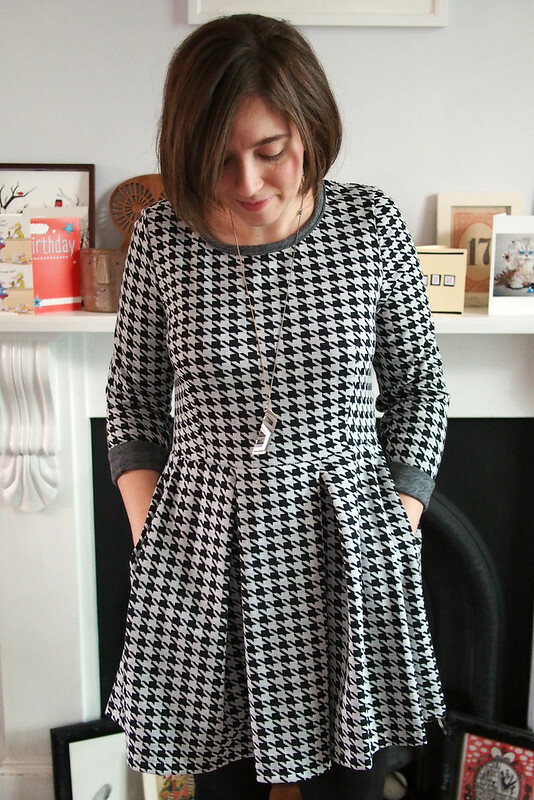 Here’s a quick wee dress that I worked up a couple of weeks ago. I wore it today so snapped some quick photos to share. 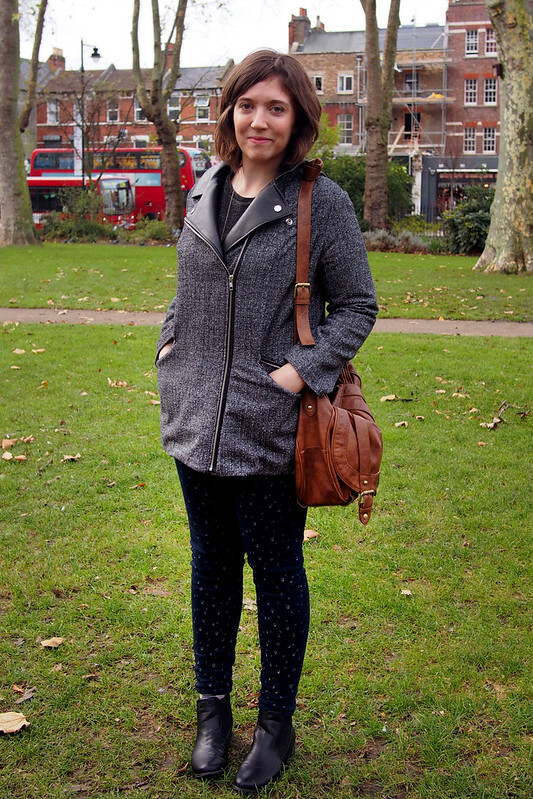 I made it the night before a sewbloggers’ Goldhawk Road meetup actually: I believe they kick you out of the meetup if you don’t wear something handmade (that’s a lie), and I fancied something new to wear for the occasion. 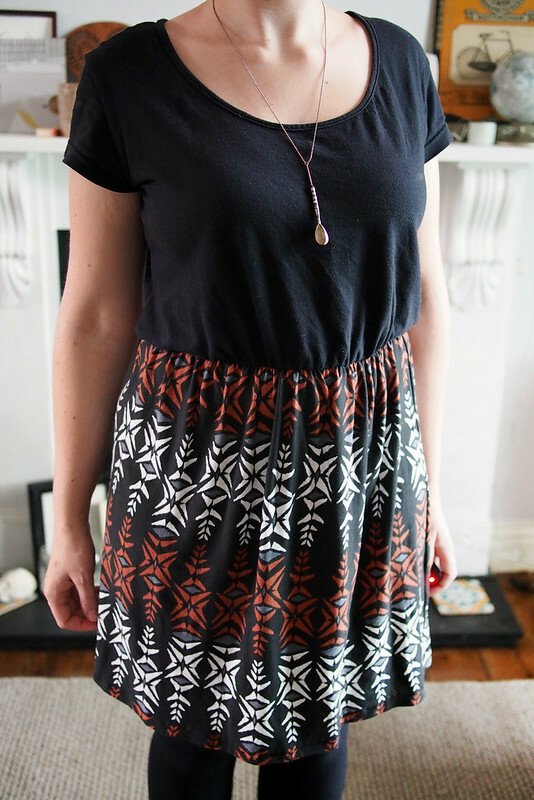 This actually barely counts as a real sewing project, because – shhh – I just took an existing t-shirt and added a super simple knit tube skirt to upcycle it into a frock. It barely warrants explanation, but I just lopped the bottom off the tee and stitched on a rectangular tube for the skirt, gathering both with elastic at the waist. Sometimes a non-technical instant gratification project is fun if you just fancy a little evening project; it was good to be spared the borrrring task of finishing necklines and cuffs for a change, too. 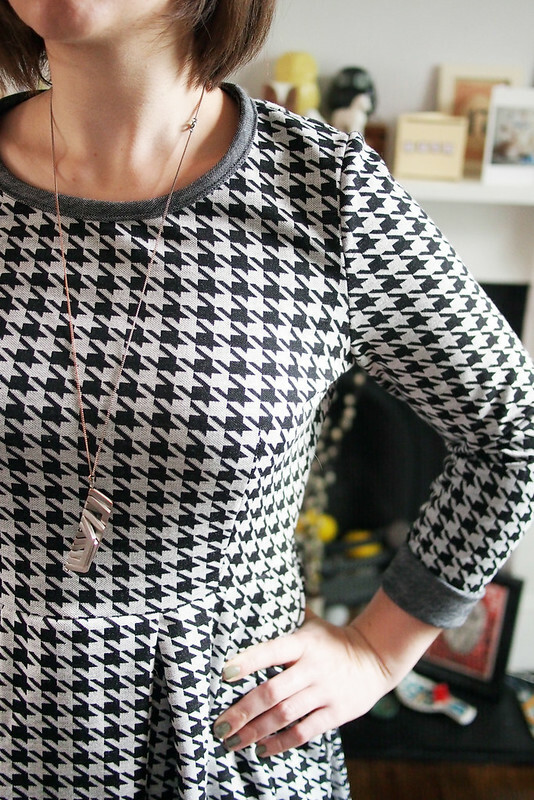 I love the print of this knit; it was one of my remnant bin finds from Rolls & Rems. 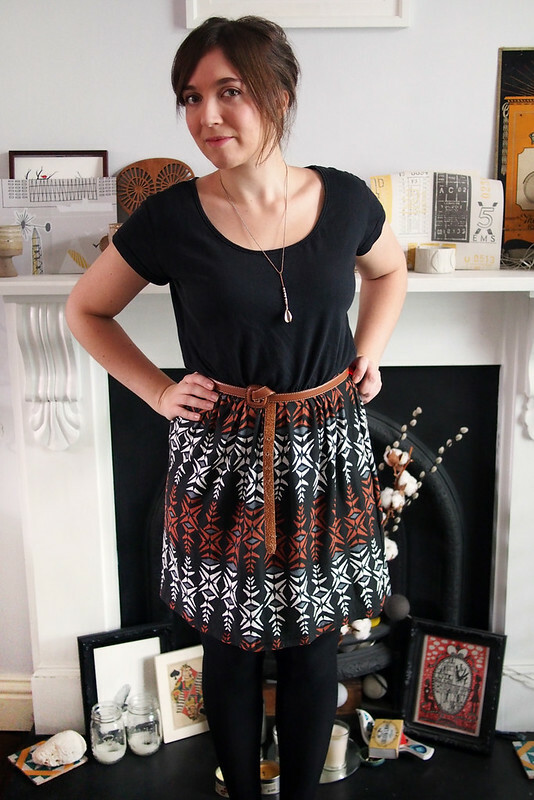 This is a great remnant stashbuster project since you only need a piece about 22 inches long to make a mini length skirt. Pleasingly standard 44″ wide fabric is the perfect gathered skirt width for me so I just seam selvedge to selvedge. 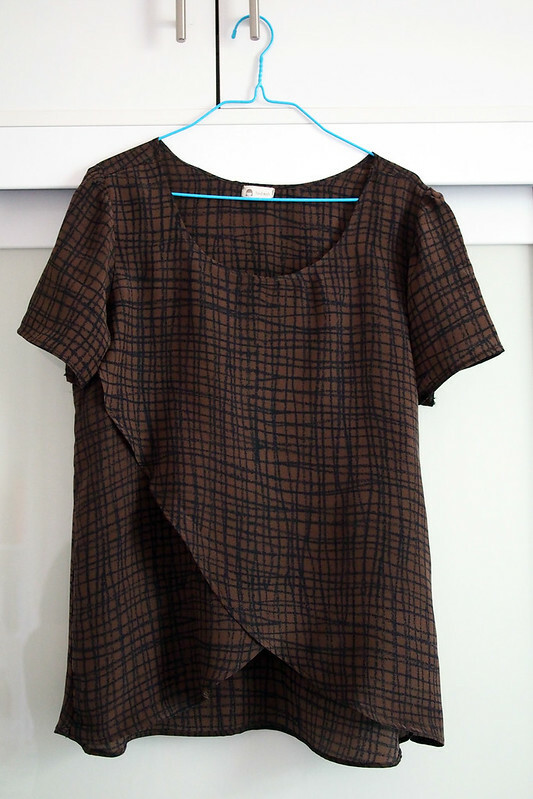 I find I like to wear dresses more than separates these days, so I’m going to dig though my wardrobe to try and match up some more tees to stashed scraps – it would even work fine with wovens. 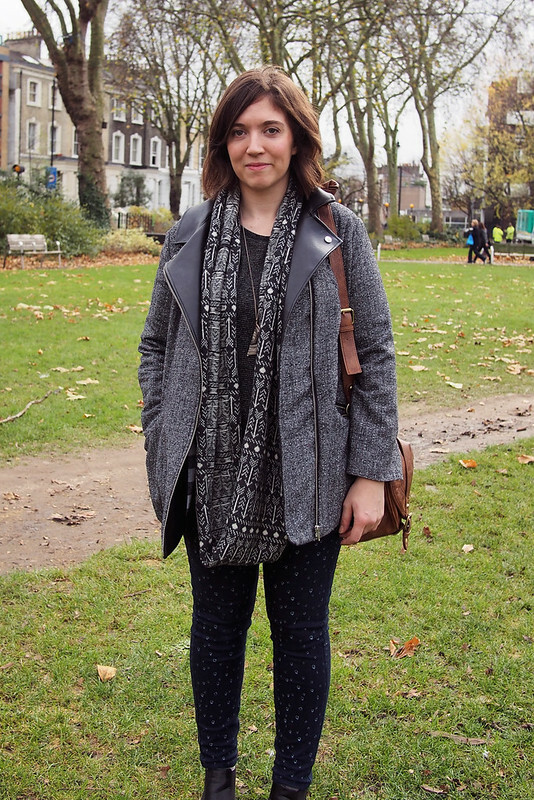 Here’s how I wore it today (+ a coat of course) for a lovely Saturday wander around the best of East London: dropping into the Donna Wilson sample sale, a browse on Columbia Road, brunch at Mr Buckley’s finishing with the record and beer festival at Spitalfields. Josh wore his shirt too (he wears it a lot, so proud) so we were a real me-made couple! Leaving you with a couple more coat peeks. The lining’s going in, we’re on the home stretch! Hope I can share – and wear – the finished thing very soon. 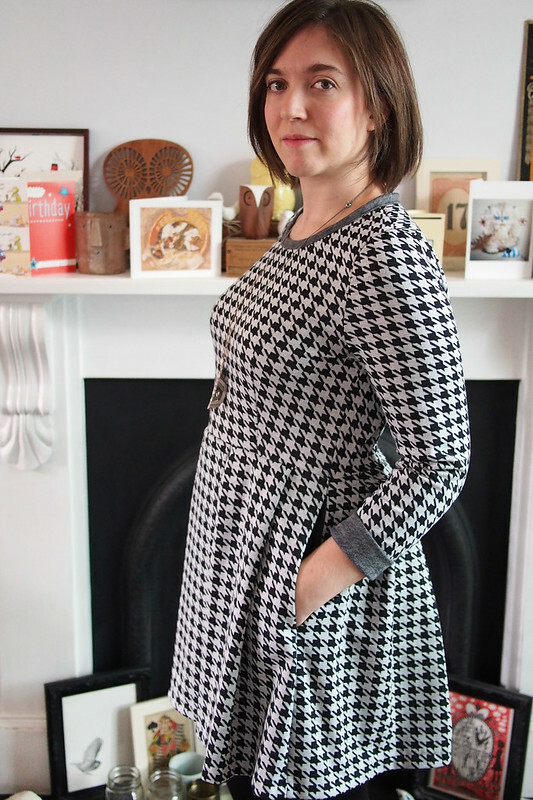 The pattern is Burda 7034: X-shape dress. I suppose it’s called that because it’s well fitted at the waist and then kicks dramatically out, with a strong shoulder too. The pattern also features a peplum blouse option but I can’t imagine it flattering many people, especially in shiny purple satin (Quality Street, anyone?). I looked past the pattern envelope’s taffeta Tin Man stylings of the main dress too: I know we’re starting to get into the festive season, but that’s no excuse to dress like a bauble. 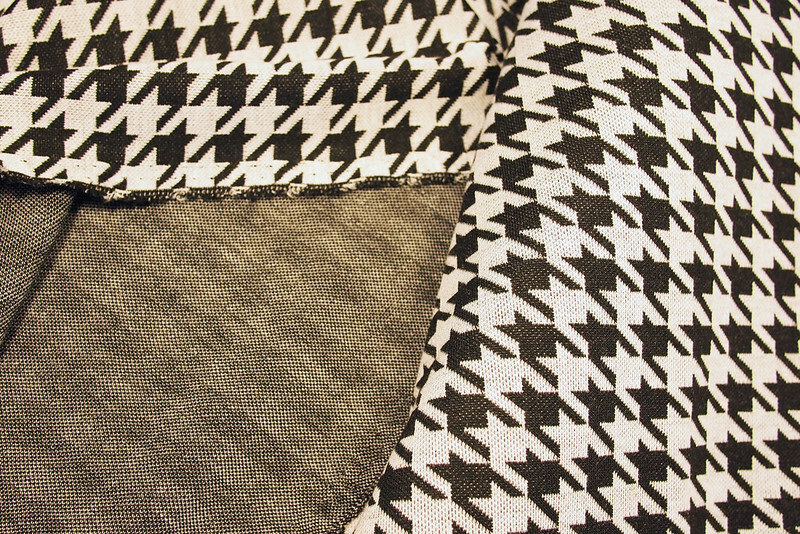 The fabric I chose is a gorgeous grey and black dogtooth/houndstooth ponte knit. 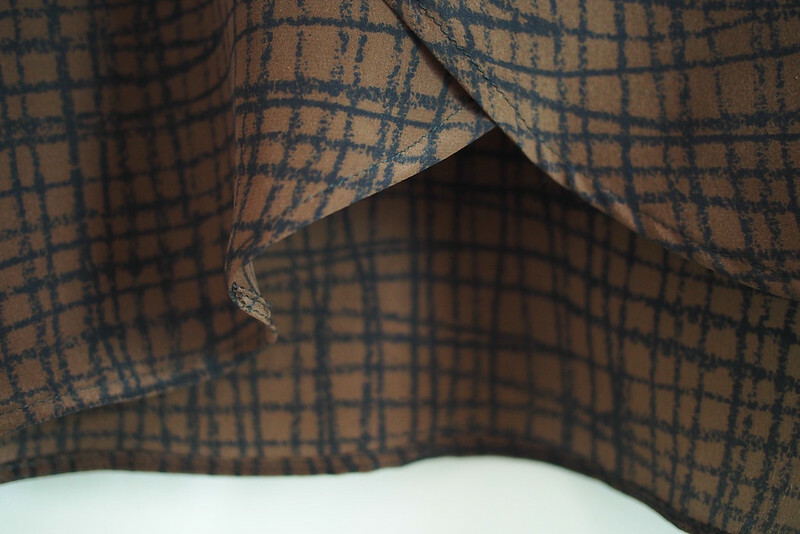 This fabric is so nice to work with and wear: it cuts cleanly with no distorting or fraying, sews without puckering, holds the pleats of this pattern crisply yet feels comfy like a sweater. I kind of love it, in case you couldn’t tell. Even the back side is pretty, with a dark grey marl kind of effect, which I managed to show off a little in my version of the dress. 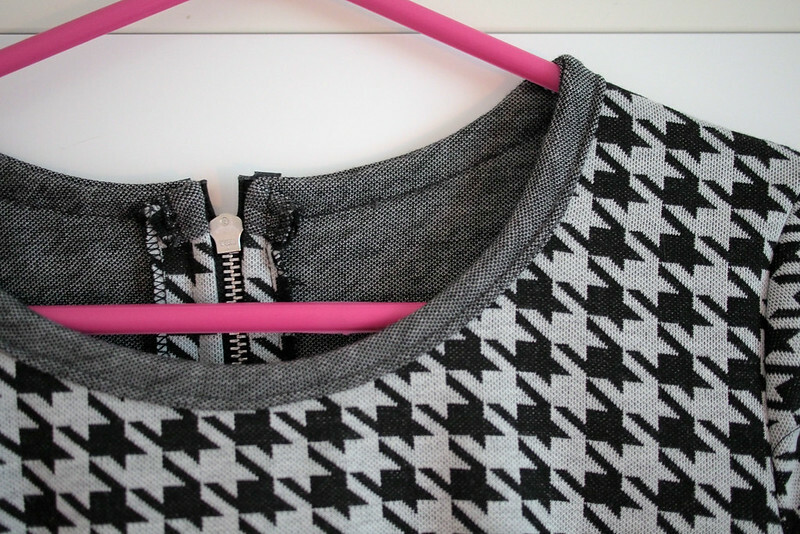 The pattern is really nicely drafted and a quick, fun to sew. 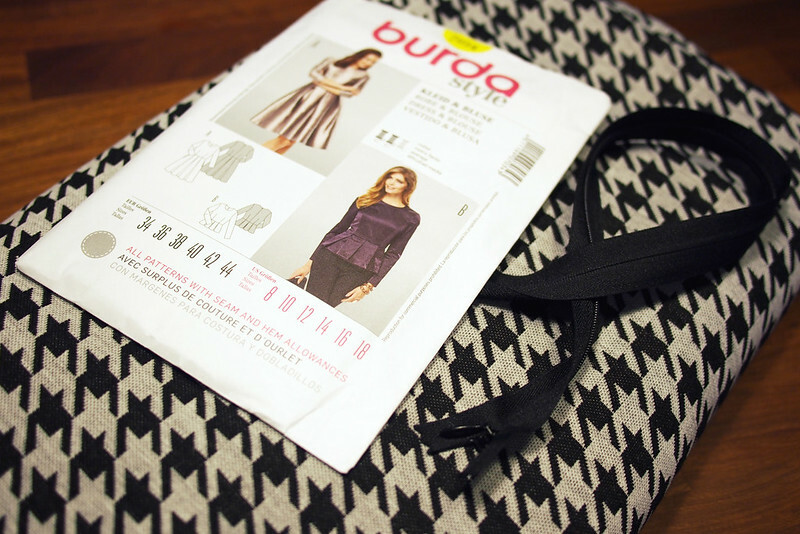 I must say, I like Burda printed patterns much more than the print-at-home ones as the instructions are so much better. The fit across the bodice, back and sleeves was pretty spot on with no adjustments, so I’ll certainly be using this pattern as a basis for some variations. I cut the size slightly under my measurements as I was working with a stretch, and it’s still got maybe an inch of ease at the waist. The skirt is really full thanks to very deep box pleats. I couldn’t believe how wide the pattern pieces were while cutting them! It creates lovely movement in the skirt. There are three-quarter and bracelet length sleeve options – I kept mine long but plan to wear them rolled back. Nice to have the option if my wrists get chilly, though. On the neckline I cut a little more of a scoop and used Megan Nielsen’s binding technique to finish it with the reverse of the fabric out. 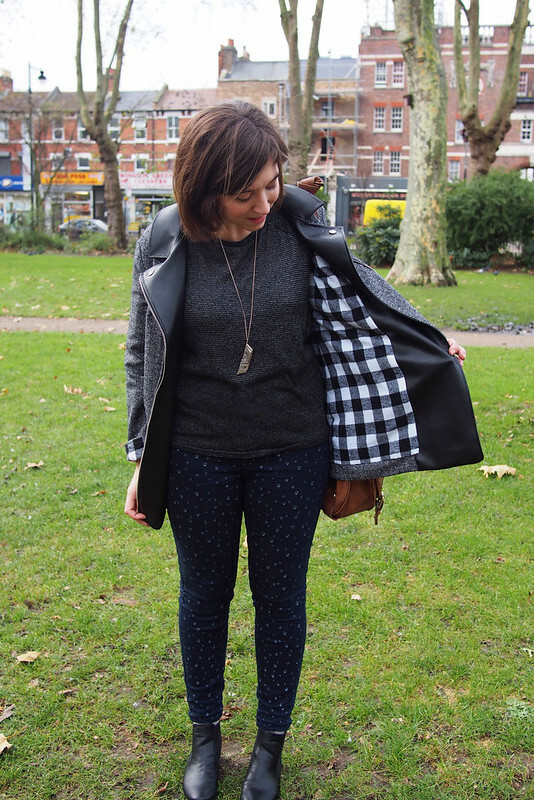 I think the dashes of dark grey help to offset all the loud print. 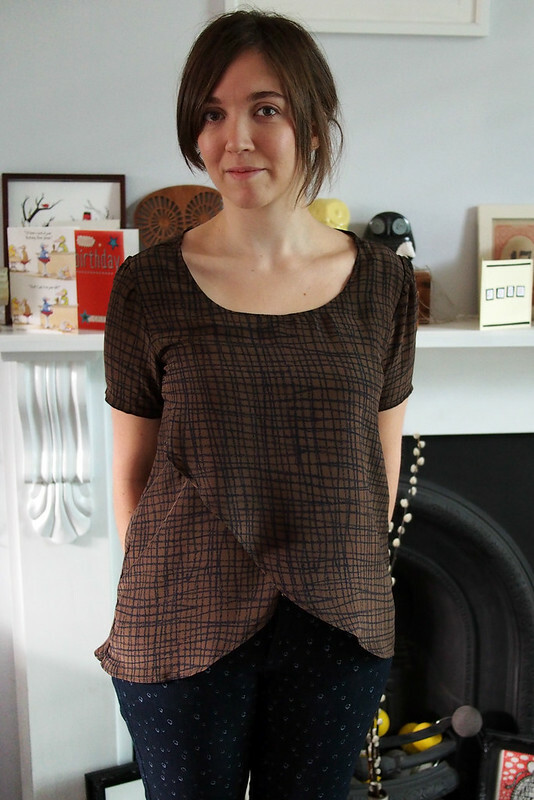 The pattern calls for an invisible zip but I used a chunky exposed one – Minerva sells these too. I didn’t really need one at all due to the stretch in my fabric but I like the effect. More details: It’s got side seam pockets which are stitched down along the waistband so sit nice and flat under the pleats. The sleeve has an elbow dart which I’ve never seen before. I suppose it’s more useful with a stiff fabric like taffeta, I can’t particularly see the benefit in my knit fabric. The bodice is supposed to be lined but it wasn’t necessary with my fabric choice. 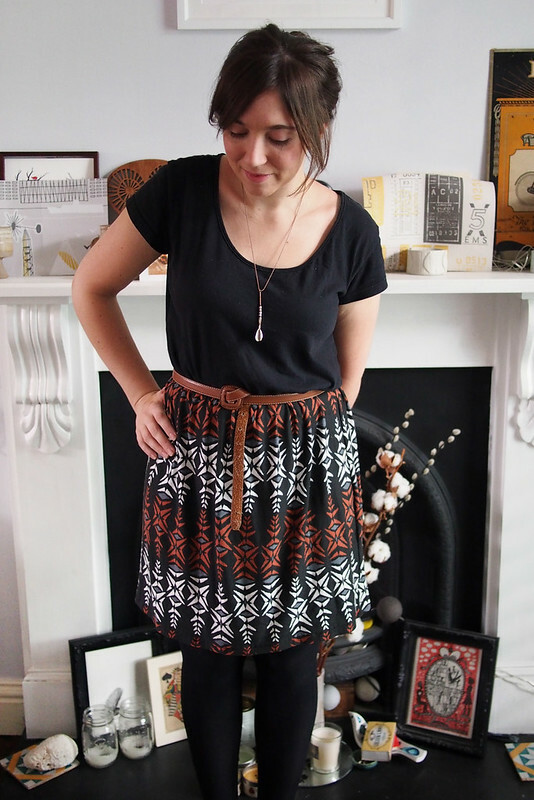 I shortened the skirt by, er, a lot – almost a foot? 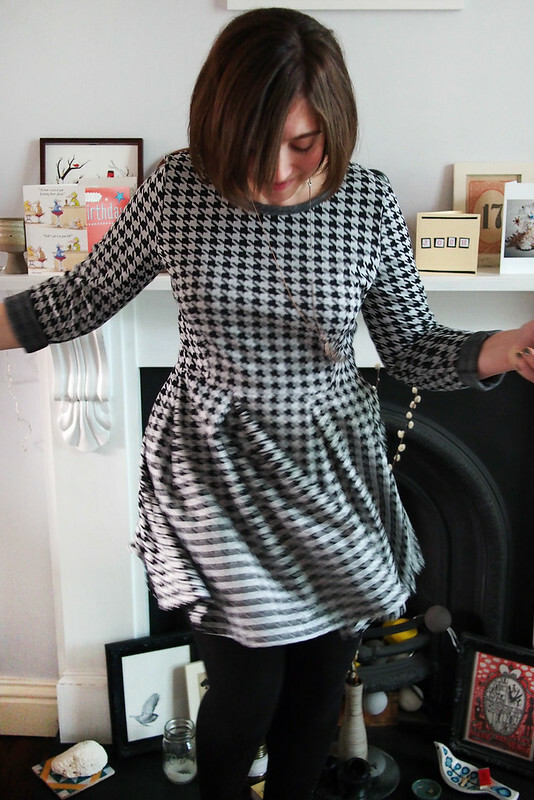 I prefer a shorter skirt with tights and I didn’t want the houndstooth to be too jarring over a large area. 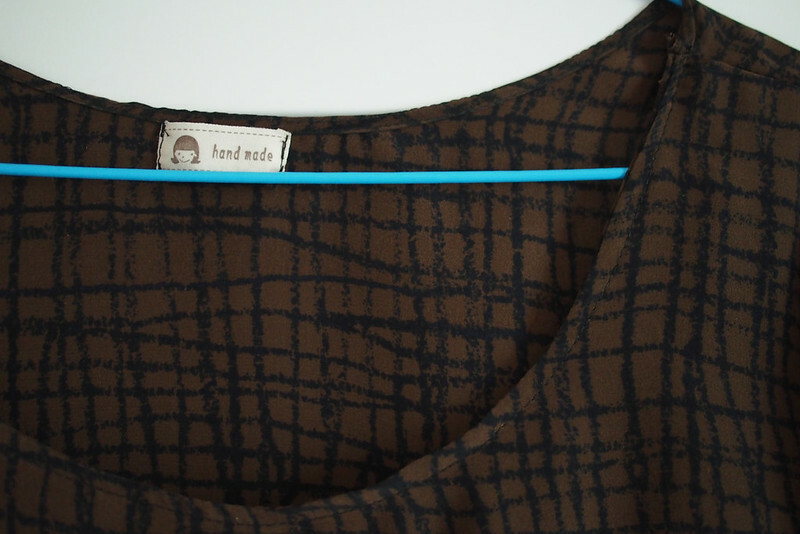 I did a machine blind hem like usual, which seems to help the pleats lay flat all the way down. Well, gotta say I’m pretty pleased with my first make for Minerva and I think this pattern and fabric are a good match, making for a cosy but on-trend winter day dress. If you fancy having a go you can pick up the kit on Minerva here. Hope you like it too! 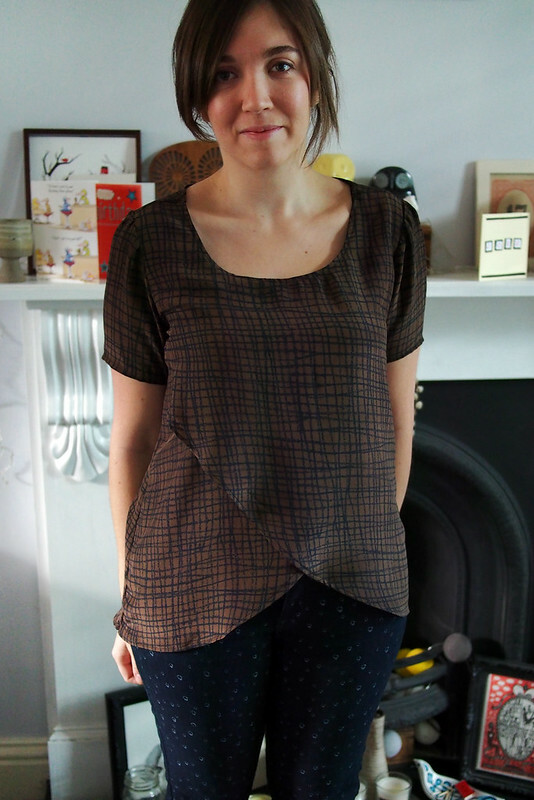 The idea for this top came entirely from Laglov’s project that I found on Kollabora. It must be one of the most hearted projects on there so chances are you’ve seen it too. 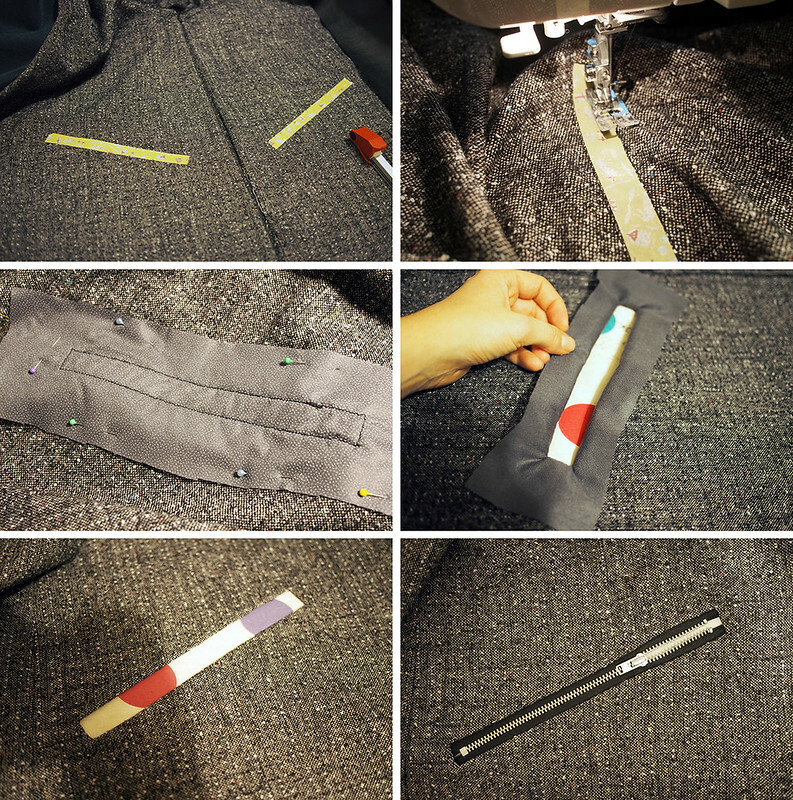 It’s a simple pattern change to the Scout – just cutting two front pieces and taking a curve out from shoulder to hem – but this little hack does lead to quite a lot more fiddly sewing work, especially when made in slippery silk. Still it only took a morning to finish, so I can’t exactly say it was laborious. I used Jen Grainline’s technique to roll hem all the edges, which worked out well. The curved fronts went a little wavy, but it kind of looks purposefully draped that way. It’s all French seamed, both for strength and to look smart as it’s not fully opaque. The nice thing is the front is effectively self-lined with the two layers crossing over so the coverage is fine. It’s a bit chilly to really show off at this time of year, but layers nicely under a cardi and it’s ever so soft and comfy. I’ll probably use this technique again with some knit fabric.